Welcome to Advanced Induction! Please have a look around as we revise our web site & don't hesitate to contact us if you don't see what you're after! We'll also be adding many more customer videos of our product in action on our Youtube Channel. Lots of results, updates & info are on our Facebook Page. Like most years, we spend Dec-Feb working our backlog down, and CNC'ing as many cores & new castings as we can fit in to get ahead for the busy spring-summer season. Right now we've got the backlog down to 3-4wk. Thank you guys so much for working with us, and keeping us so busy over the years! Current Backlog for most types of heads is 3-4 weeks. We are preparing to do a group of old school LT's this spring - get your heads inbound if you want in, please. Manifold porting & cams are an option only when we're also doing a set of heads for you at the same time. If you know you want CNC work, you are welcome to get your heads inbound & shoot us an email at Sales @ AdvancedInduction.com with info on what you're sending in, your project, goals, tracking #'s, your return shipping address, etc. With your heads in hand we can then get them in line for work, and invoice you once we have a chance to inspect them during prep for CNC work. If you have blown up, modified, or damaged cores, please wait until we can respond via email. Please be sure the name you use in your email is written on the box & put a note inside with your name, email, etc! Be sure to read our Core Policies & Packing Tips before sending in heads! It may be long, but it's important to know what is & isn't acceptable for work. When possible we want to perform work on your castings, but we do try to keep a limited # of cores on hand for swaps now. If you have extra sets of LSx or DI-LTx in undamaged/unmodified condition, we'll occasionally accept those as partial payment for your CNC work and/or buy them outright. Keep in mind, some of our shops / builders like Race Proven Motorsports, Black Label Tuning, Heintz Racing, PCM of NC, Complete Street Performance, SS LSX Tuning, Top Gear Motorsports etc. often have heads already available or currently in process. If you are working with an engine builder or shop, we're happy to do what we can to coordinate schedules with them. We are always looking for competent and trustworthy installers we can send customers to for a turnkey experience. If your shop wants to work with us, email us at Resale @ AdvancedInduction.com. Christmas & New Years: We will be out through New Years. Our 223cc fully CNC'd Dart/RHS head is a fully CNC'd aftermarket casting based head for guys on a budget. Available now at introductory pricing: Click Here for more information. Our 230cc fully CNC'd 4.00"+ bore head is based on TFS' bare LSx cathedral head & is ideal for LS2's, strokers, etc. that need more potential than a GM 243. Available now at introductory pricing: Click Here for more info! Based on our proven 226cc program, the 232cc option improves cleanup & adds another few potential HP. Info HERE. Our System Matched LSx Heads & Cam Kits have been added to the site HERE. Our most common LSx Cam Kit options have been added to the site under LSX>Valvetrain>System Matched Cam Kits. A customer has performed a true A/B dyno test changing only the head from an aftermarket CNC head to our 218cc CNC'd GM 5.3. The result? Gains throughout the entire RPM range enhancing both low RPM manners and performance! 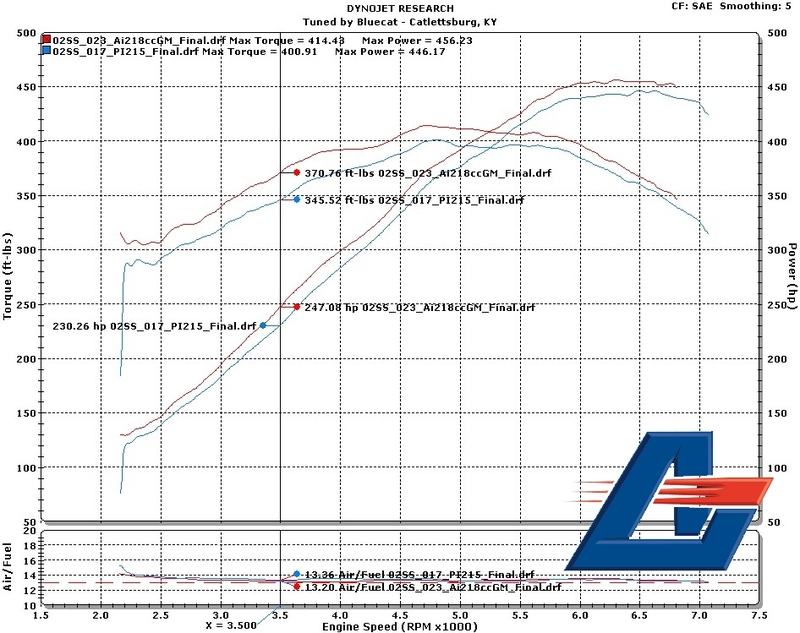 His LS1tech results thread is here. A variety of GM LSx head machining options from our Performance Rebuilds to full CNC porting have been added here. More photos, results, and links will be added in the near future. Ai LSx Cams added here. Many more grinds to be added as time allows. We're currently testing new TFS casting based LS heads! Look for updates, availability, and pricing soon. Our small chamber program for the GM 241 casting is currently available. No longer will the 241 guys be forced to choose between compression or camshaft size due to the typical large chamber designs.